The Outer Banks is shaped by wind and water, connected by the elements. Look no further than the area’s State Parks and State-recognized attractions to see how our story intertwines with those of the elements. The NC Aquarium at Roanoke Island and Jennette’s Pier bring you closer to the fish and sea life that both sustain and fascinate us. The Graveyard of the Atlantic Museum tells a different tale, explaining its namesake with artifacts and information from the thousands of shipwrecks off our coast. While technically a form of transportation, the NC Ferry System is much more, carrying passengers and cars between Hatteras and Ocracoke and other points beyond. The ferries highlight a culture and natural heritage of the OBX. Speaking of culture, and back on land, we step back in time with a tour of the resplendent Elizabethan Gardens and then immerse ourselves in a celebration of the first English settlers at Roanoke Island Festival Park. 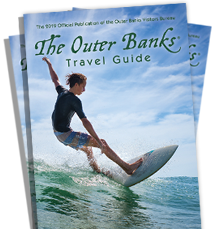 Not to be outdone, the Outer Banks continues its dance with the elements by leading us to Jockey’s Ridge State Park, one of the State’s most visited attractions and home to the East Coast’s tallest natural sand dune – just perfect for the hang-gliding classes and events that take place there annually. Also a pretty fantastic place to fly a kite!